It has been a busy summer and fall. We have been working on wildfires and prescribed burning projects, but things have finally calmed down enough to get some metal work done. 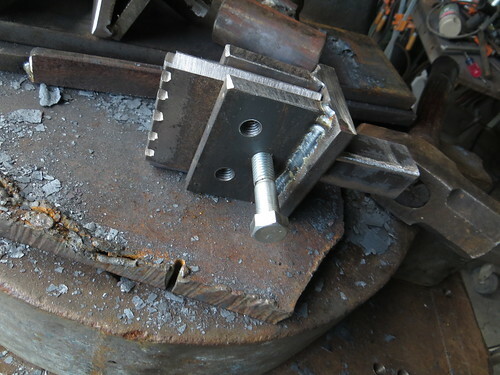 I am making texturing dies for the fly press, mainly from 1045 medium-carbon shafting – 1″ round bar. Most of the dies are worked hot, and then finished on a metal lathe. Others are done completely on the lathe. Most of these tools will be used on hot metal. These were cut with the lathe, and then hardened using a brine quench. Some are hand-filed or cut on the lathe and then forged. The flower is built from rods and hand-filed. Negative was faced on lathe. Next step – using these for some projects. 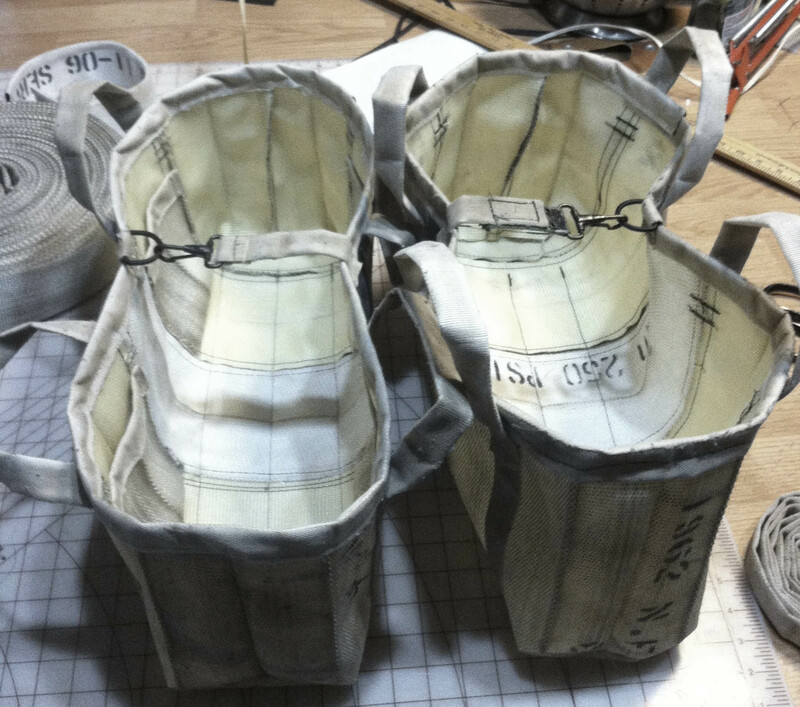 Just made a couple of fire hose tool bags for our friend Dave Richer at Earthen Iron. They do ornamental metalwork and custom forgings, and need to lug a bunch of hammers, chisels, and clunky tools around to their various jobsites, and the old milk crate wasn’t cutting it anymore. We made them two 6×20″ bags out of indestructible fire hose that nest inside of their rolling tool chest. One bag is going to be used for hammers and punches, the other for small tools. 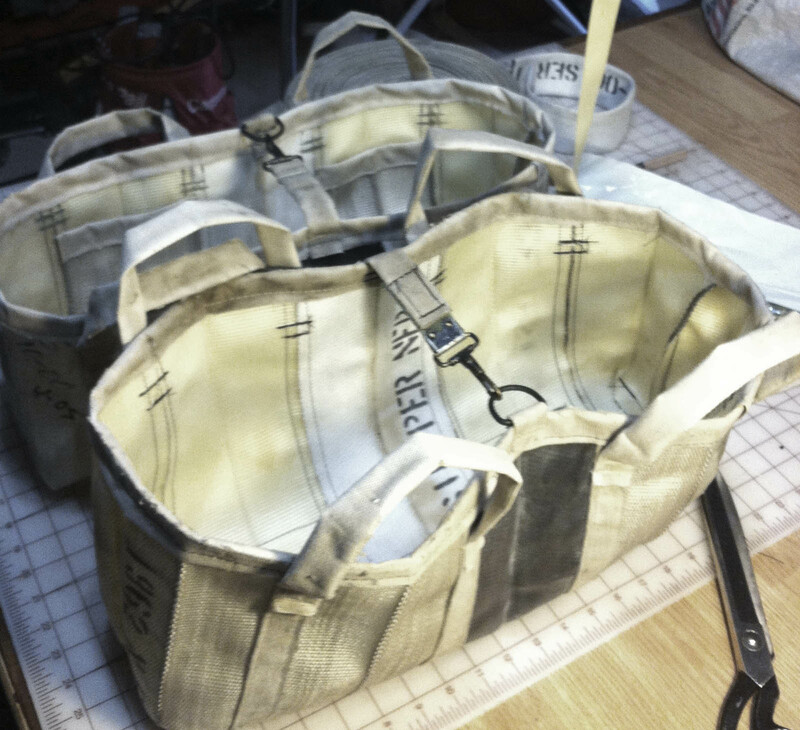 The small-tools bag has pockets for pens, small chisels, and bits. These bags are 99% recycled. The only new material in them is the thread. $80/apiece or 2 for $150. Email us. Just finished a four-year-old project. I think that reason that I only made one back in 2009 was that these bags are deceptively complicated, and the first one took so long. I forget about this until somebody finds a picture of one of our bags online and sends me a custom order like this one. Then I say that I can do it for $200 and it takes me 20 hours. Man, they are a lot of work. I was feeling it yesterday, though, and had a little time in the shop with Penny Lee and KZFR. I wanted to make a new one that incorporated the tweed and leather style that we have been toying with for our new handlebar bags. The tweed is backed with heavy-duty cordura packcloth. One reason that the bags take so long is that we build a separate suspension/harness out of seatbelt webbing that distributes the load across the whole panel – I was worried that if we just used leather, that the loops that go over the top of the Xtracycle frame would stretch or sag – you can see the harness as 2 lines of horizontal stitching about 3 inches down from the top. Another reason I quit on the last one was that our walking foot machine wasn’t working very well, and it kept choking right in the middle of each line of decorative stitching. Unlike nylon or other textiles, if you blow a line of stitching in leather, when you pull the thread, you are stuck with a bunch of holes in the fabric that don’t rub out – you have to start over. The main panels for these bags use 9 square feet of leather each, so mistakes are expensive, or you just have to live with them. Leather is fairly heavy but so are Xtracycles! These bags probably weigh more than some road bikes, but we aren’t weight Nazis around here – we’d rather look cool. Also, Chico is flat. The straps are military-surplus cam buckles. One day a guy showed up at our house with a shoebox full of them (about 80). He said ‘Some of your friends from Westwood go you our church and they told us about you, do you have a use for these?’ They are great. Thanks Larry and Seren! I have been liking having tie-downs for ratchet straps and bungees, so we added extra loops to the webbing that holds the buckles, and ask some sewn loops between each buckles. We can make you a pair, but it might take us a few years to finish them.